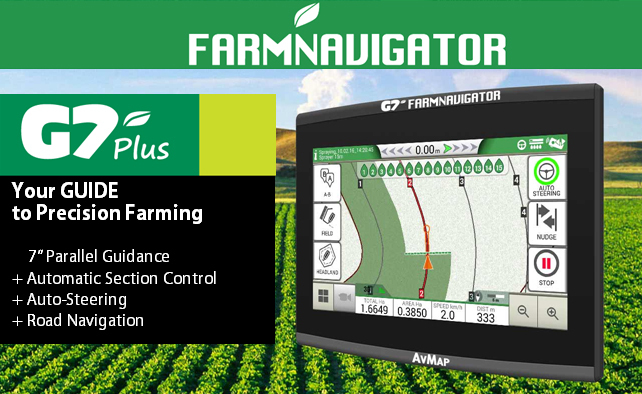 AvMap, the Italian manufacturer of GPS solutions since 1994, presents G7 Plus FARMNAVIGATOR, a powerful yet easy-to-use GPS ideal for operations such as mapping, fertilizing and spraying, as well as high precision operations with automatic steering. G7 Plus features the same multi-touch, ultra-bright 7” display of the G7 Ezy version. The installation takes only few minutes: place the Farmnavigator on the bracket, plug the power cable and connect the external antenna into the DB9 serial connector. • Manage the headland: optimize spraying and seeding operations especially for irregular and triangular areas. The headland function allows working the headland at the end, avoiding unnecessary overlaps. • Save and manage all the data in the Jobs' Database. For each job, G7 Plus saves farmer, activity, field, implements used, products used, worked area, total time etc. • Use G7 Plus Farmnavigator with the Farmnavigator Auto-steering Kit to achieve the maximum precision and reduce the operator fatigue. • Let G7 Plus guide you throughout in Europe tank to the included Road Navigator with HERE maps. At the moment maps are available for Europe, Brazil and South Africa. Turn-by-turn vocal instructions can be heard through an A2DP Bluetooth speaker (not included). 2. G7 Plus Farmnavigator can be used with the Farmnavigator Auto-steering to achieve the maximum precision and reduce the operator fatigue. The Farmnavigator Auto-steering System controls your vehicle steering and helps you stay on track, perfectly following the guidelines set on the Farmnavigator. You can disengage the Auto-Steering by firmly grasping the steering wheel; you can engage it again very easily by tapping the icon on the Farmnavigator display. 3. Updating G7 Plus Farmnavigator is super easy with the Wi-Fi Software Updates. 4. G7 Plus includes a European Road Navigator with turn-by-turn vocal instructions via Bluetooth (compatible with A2DP Bluetooth speakers). 5. The remote control is included in G7 Plus ( optional for G7 Ezy). Last, but not least, the FARMNAVIGATOR family is now complete with a full range of useful accessories such as power adaptors and connection cables for any need. You can choose the other compatible DGPS receivers to fit your precision requirements. For example, FARMNAVIGATOR can be combined with the new Smart GPS / GNSS receiver that offers GPS and GLONASS concurrent GNSS operation, SBAS tracking for increased position accuracy and 10 Hz Update rate; it is NMEA 0183 compatible and it connects to G7 Ezy with a 4m power cable. Available on the shop on line: www.avmap.it/farmnavigator and through AvMap distributors. AvMap, the Italian manufacturer of navigation systems since 1994, offers a wide range of applications in different sectors: avionics, marine electronics, automotive and precision farming. AvMap manufactures products for the B2B, B2B and OEM markets. AvMap Products are 100% made in Italy and sold worldwide. AvMap’ partners include PSA Group (Peugeot and Citroën), Toyota, Jeppesen and many others.